The new parade at Disney’s Animal Kingdom is a traveling, interactive island street party that features Disney characters “on expedition” and a tribute to their animal friends. As the procession winds through the park, a menagerie of abstract animals comes to life in handcrafted theatrical designs -- “bursts of living color,” says producer Paul Nichols. During each parade presentation, nearly two dozen guests get in on the action in customized rickshaws that accompany the Disney characters traveling in safari vehicles. Minnie Mouse, for instance, appears as if she brought all the comforts of home along on her safari, with steamer trunks, wardrobe cases, hat boxes, even a bathtub (with bubbles continuously floating out). Party Animals and energetic Party Patrols coax the audience into a sing-a-long music fest as the parade winds throughout the park. Starts at the Tusker House Gate at Harambe Village. It winds through Disney's Animal Kingdom and returns to the Tusker House Gate. The procession consists of individually designed elements that bring a variety of heights, colors and abstract animal visuals to create a fun, theatrical showcase for the Disney characters. The elements include five character-based safari vehicles, four drum sculptures, three rickshaw taxis, eight animal puppets, 16 Disney characters, 10 Party Animal stiltwalkers and 10 Party Patrols. The eight abstract animal puppets were designed by Michael Curry Designs in Portland, Ore., which created the puppets for Disney's "The Lion King" on Broadway. The main musical score was written by Disney Show Director Reed Jones and Music Director Dan Stamper, who was nominated for an Emmy Award for his work on Super Bowl 2000 in Atlanta. All musical arrangements were orchestrated by Gordon Goodwin and recorded in Los Angeles. 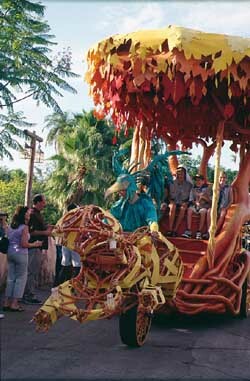 "Mickey's Jammin' Jungle" parade costumes were designed by Matt Davidson. The prototypes for the puppeteer costumes were crafted in Africa by native artisans. Parade costumes were created at Walt Disney World Creative Costuming, Parsons Mears in New York, Costume Armor in New York and Vegas Costumes in Las Vegas. Features 60 cast members including performers, drivers and coordinators. As "Mickey's Jammin' Jungle" winds through the park, a menagerie of abstract animal images comes to life in fun, theatrical designs handcrafted from an eclectic mix of natural materials and fabrics. Soaring animated puppets and towering percussive drum sculptures create bursts of living color against Disney's Animal Kingdom's dense jungle greenery. Elaborate rickshaw taxis put selected guests in the middle of the parade, accompanied by Disney characters in customized musical safari vehicles. A troupe of 8-foot-tall Party Animals and energetic Party Patrols interact with guests and direct them in the creation of the live call-and-response sing-along music fest. Up to 25 special guests will be selected daily to ride in the opening unit, three guest rickshaws and the finale unit. Guests will be given Kodak disposable cameras so they can capture the special moment aboard the parade. Adventure Rover -- This opening rover is a brightly colored red, orange and yellow safari vehicle. It carries the beloved Disney character Rafiki, from the Disney animated film "The Lion King." Rafiki rides with a guest family, which is selected daily to participate in the parade. Character Jeeps -- These three jeeps carry several of the most famous of all Disney characters including Minnie Mouse, Donald Duck and Goofy. The vehicles and floats are themed to the personalities of each character. Donald's jeep pulls a float painted in various hues of blue with a sports and nautical theme. Minnie's jeep and float are painted with her signature red and white polka dots adorned with a big red and white, polka dot bow. Goofy's jeep and float feature a hodgepodge of items, ranging from oversized snowshoes to a pair of pajamas. Bon Voyage Caravan -- The Bon Voyage Caravan features a brightly colored jeep carrying Mickey Mouse. This jeep pulls a float consisting of several different safari-themed segments. The float carries Mickey Mouse and a guest family, which is selected daily to participate in the parade. In addition to the myriad of characters participating in "Mickey's Jammin' Jungle" parade at Disney's Animal Kingdom, guests can see Disney characters including Pluto, Baloo, Louie, Brer Rabbit, Brer Bear, Timon, Terk and Chip 'n' Dale. Goofy and Friends Jam Through the Animal Kingdom. An Artist's Concept for Mickey's Float.